What Day Of The Week Was March 26, 1979? 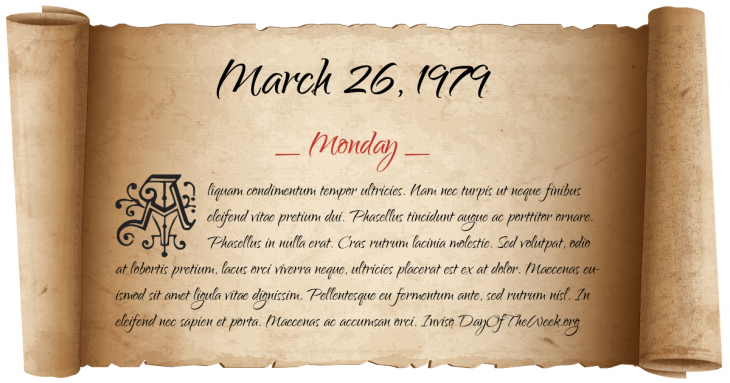 March 26, 1979 was the 85th day of the year 1979 in the Gregorian calendar. There were 280 days remaining until the end of the year. The day of the week was Monday. A person born on this day will be 40 years old today. If that same person saved a Quarter every day starting at age 4, then by now that person has accumulated $3,293.50 today. Anwar al-Sadat, Menachem Begin and Jimmy Carter sign the Israel-Egypt Peace Treaty in Washington, D.C.
Who were born on March 26, 1979?